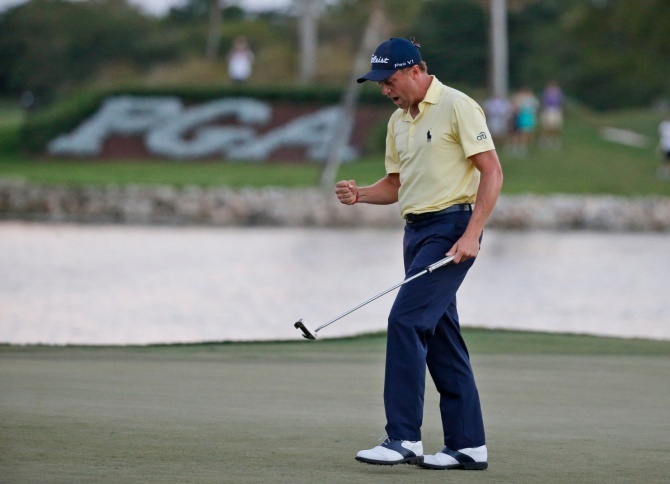 PALM BEACH GARDENS, Fla. — Justin Thomas is another young player that Tiger Woods has brought into his golfing circle, not only spending time with him but sharing some of his experience that led to 79 victories on the PGA Tour. As recently as last week at Riviera, when Thomas was within range of the lead going into the final round, he said Woods sent him a text to dispense some advice and wish him well. That changed on the eve of the final round of the Honda Classic. “Got crickets last night,” Thomas said with a laugh. That’s because Woods was playing, and he was playing well. Just not as good as Thomas. Thomas delivered a moment that so many times belonged to Woods on Sunday. He was tied for the lead with Luke List on the par-5 18th at PGA National, with List already on the green and some 35 feet away for eagle while Thomas had to lay up from the rough. He needed a birdie to have any chance of a playoff, and his gap wedge from 117 yards was so pure that it rolled 6 inches by the cup and settled 2 feet away. Given a second chance in a sudden-death playoff with his 2-under 68, the 24-year-old Thomas came through with another clutch shot. This one was a 5-wood over the water on the 18th, toward a bunker. Thomas barked at the ball to go a little further, just to be safe.